Oh wauw Amy, I LOVE the paper with the little flowers and your box is fantastic! Amy honey your card is so precious! I just love this image! Love it, Amy!!! What a fun project! Beautifully done, dear friend! Beautifully done- the simplicity adds to its elegance. Love your great colors too. SOOOOOO sweet and ADORABLE Amy, what a GREAT layout! Amy, this is so cute! Super job with this image! =) I love that pretty floral paper you used... so feminine. 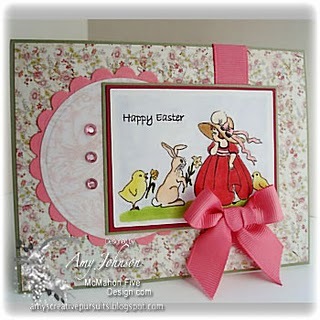 I just love the elegance and feel of this card! SO beautiful. Super cute card, Amy! Great image & I am lovin' that sketch, your papers and colors!